From Khan al-Assal to Khan Sheikhoun: "Syria's (Other) Sarin"
Claims of sarin use in the recent Idlib chemical attack have been accepted from the start, first based on reports and videos describing consistent symptoms. Soon there were also said to be positive test results from samples sent to Turkey. This is presumably accurate and suggests at least some victims, if not all of them, were exposed to that deadly nerve gas. As I explain below, there's a lot that this wouldn't explain; it's already been widely argued that sarin might have little or nothing to do with the videos shown or the dozens reported killed. I agree with that line of questioning, so all this below matters to the extent sarin actually does, which at the moment is uncertain. But if sarin is involved, centrally or otherwise, it's best to acknowledge it. It's of course possible there was sarin, and it was dropped by government forces as alleged. But we're watching for the nightmare scenario: it was slipped in to a terrorist false-flag event, pro-rebellion investigators and their bosses refuse to acknowledge that, and they insist on blaming the Syrian government, encouraging more such terrorist crimes. Low-level exposure in survivors could be voluntary - people can be paid or persuaded to sip on a weak dilution, with pauses to metabolize, which would give positive results with minimal discomfort. These volunteers, selected for their pro-jihad stance, could also use their status as supposed survivors to describe the government attack in full detail, along the rebel script. Soil samples can be contaminated after the fact, or by sarin vapor actually dispersed by terrorists, using various special rockets and mortar shells they have on hand. Military grade sarin: professionally-produced, this appears and behaves just like water (it's dispersed as a vapor, not a gas). It has no color or smell, and no irritating properties, besides a long shelf-life and high killing power. Low grade "kitchen" sarin: less stable and perhaps less deadly, it usually has impurities not filtered out at each stage of production. Therefore, it can have a variety of colors and usually unpleasant odors (Wikipedia says “impure sarin can smell like mustard or burned rubber” and we'll consider other possible smell descriptions below), and may also have contaminating irritants that can burn the lungs and eyes. Now, we've heard physiological samples tested positive. But with the hyper-speed metabolic processes at work inside the human body, the actual agent is long-gone by testing time, just leaving secondary chemical after-effects. These cannot say which kind of sarin it is, military grade, Syria's, or some low-grade "kitchen" sort. However soil samples don't have that problem - the molecules lay there, only breaking down slowly. If the samples are genuine and not tampered with, this could show the kind used. Soil samples were reportedly taken, and the UK's ambassador to the UN Matthew Rycroft stated something has "tested positive for the nerve agent Sarin, or a Sarin like substance." This ambiguous statement leaves it open that it might not even be sarin, just something chemically similar (maybe some other organophosphate poison). It definitely doesn't say whether it's a match or a mismatch with Syria's stocks (more at ACLOS). So we don't yet know what the tests say, or even if the results are honest. And even if we did have a sure finding, considering the unknowns, it's important to mention this - neither kind is certain proof for who deployed the stuff. Naturally, the military-grade poison suggests it was used by the Syrian military. Even though they supposedly gave it all up years ago, that seems easy enough to get around by claiming they must have kept some. The other kind points to opposition forces. Hypothetically, rebels could make or acquire the pro kind, possibly even from Syria's own seized stocks, with the right help from any of their powerful allies. And the government could, without too much hassle, synthesize or seize the cheap kind and have it to toss around and frame the rebels. But otherwise, we should tentatively presume the indicators point the normal way. Let's see what they are. In the April 4 attack, in the absence of clear test results so far, we have reports. These we also can't trust, but they're worth considering. Two AFP journalists in Syria, Mohamed Al-Bakour and Omar Haj-Kadour, spoke on their reporting in a special piece. Bakour, from Khan Sheikhoun, said "When I get to the hospital, a foul smell hangs over the place. I can’t quite put my finger on it." Haj-Kadour was in Binnish and headed south upon the news. "When I get to the main hospital in Khan Sheikhun, the first thing that strikes me is the smell. There is a strange smell. I can’t put my finger on it." They both note the lack of fingerability a little too clearly. Perhaps they talked with each other first, one said that, and the other one liked this English phrase and copied it. But they agree there was a smell that was strange in a bad way one calls "foul." A Telegraph sourced wire story at SMH.au Some interesting detail e.g. "The smell reached us here in the centre; it smelled like rotten food. We've received victims of chlorine before – this was completely different." Foul, strange, rotten food, vs. mustard, burned rubber - all have organic elements that might be from one organophosphate poison (like sarin), with a central smell or cluster of smells that's somehow between these, hard to "put your finger on" and easy to describe differently from the next guy. Some other cases of different descriptions are listed below: "pungent," perhaps like sulfur, like rotten eggs, "like burning nylon," and "very foul." Mohammad Nejdat Yousuf, a farmer mildly poisoned, spoke to the New York Times from Turkey with his pregnant wife and nephew, alive but seriously affected. It's said "ran headlong into what he described as “a winter fog — not quite yellow and not quite white.” He started to lose his balance, he said. His eyes began to sting. His nose started to stream. Finally, Yousuf said, he started to foam at the mouth." A Zuhair Abu Abdo spoke to the media saying he heard a "very loud" explosion, which was followed by "yellow dust" and a "really disgusting odor," smelled from far away. Still, "we thought it was a normal airstrike" but he saw may people just laying on the ground, and driven off in cars. He describes later symptoms: light-headed, tight chest, and later burning eyes. An al-Yousef son, aged 23, says in this video "it was a strange smell," people vomited, foamed at the mouth, and fainted. A cola-dipped rag over his nose kept him safe. * Man (not credible): massive bomb, dust covered the place, 50 people laying outside his house, he treated some before the second strike. He had no clue it was chemical, he got dizzy but kept helping, and then the third strike, and a 4th, and he felt dizzy, fell down. Miracle he survived 4 delayed strikes all around him... No mention of smell. * older woman: a barrel bomb landed, the stench covered the place, we were fast asleep, "all of us altogether" lost consciousness, woke up here. * medic: mentions the usual symptoms: miosis, "constant shivering," and "yellowish foam coming out of the mouth." * (add 4/30) White Helmets/"civil defense" worker, says on Orient News video he came home (around here on Wikimapia, south of the White House crater), found everyone unconscious inside, wife, children, brother and his wife, nieces and nephews, most or all died. A yellowish foam was coming out of their mouths, as they shook uncontrollably. But clearly - if this is the sarin they're talking about - it's the "kitchen" variety with irritating impurities that, as I explain next, terrorists have used in the past. And if it's not, then ... what is it, and who released it? While witness accounts are never to be taken as obvious truth, it's likely that a noxious gas like they describe was released in Khan Sheikhoun that day. not only plausible but seemingly supported by visual evidence. Below are two panoramic composite views from two videos associated with the attack, taken from north of the city. They both seem to share the same exact point of view (features line up the same in both), so we can make a direct reading - if this is all the same day. I'm presuming so, but noting it might not be. Video 1: Left to right: (off-frame, unseen) the space above the White house crater cited as "the" sarin release point - smoke plume from a high explosives blast southwest of that - another the same way - a strange white cloud, apparently originating just NE of the tel (big flat hill) - the tel, continuing ... - blurry minaret in the middle - another standard explosives blast from a bomb or rocket, roughly geolocated to the southwest of the tel (new graphic upcoming) - (off-frame) a smaller black plume rising from a located spot in the town's southwest. 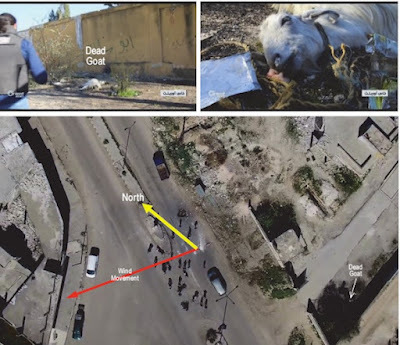 Bellingcat did a good line-of-sight analysis for this scene, which I copied (roughly) to make a rough map (ACLOS) of where these 3 plumes and a white cloud might be. Better map based on my own findings forthcoming. Wind: seems to be blowing to the left and towards the camera, so north and east, ratio not decided (see video, and just the shape of the plumes). Time note: I tried reading solar azimuth (direction to the sun) from how it wraps around circular things (minarets, dome). I could only say it's between 82 and 113 degrees, so anywhere from sunrise to 9:30. I cannot even see a time difference between the views, unless mmmaybe ... the fog scene is a bit earlier. It should be later. But visually, it seems to all be the same basic time, so - if this is really all from the same day - those blast plumes disappeared and that fog spread out - or vice-versa? - very quickly. A strong wind could help, maybe the one seen. The direction seems about right for that. First time-able visual of victims is at the White Helmets cave hospital, in scenes I time visually by sunlight angles (several cases, consistent) as starting around 8 am or shortly before, and continuing to 8:30 and beyond (I only looked at the longest-shadow scenes - not sure how long it runs past 8, but not far before). Anyway, there seems an odd delay here. I'm pretty certain I have all the time zone and DST issues correct - it is about an hour off from what it should be. It doesn't just seem that way. Or, since reaction can't be instant, it just seems a bit slow, and a bit late for people to still be struggling at death's door. 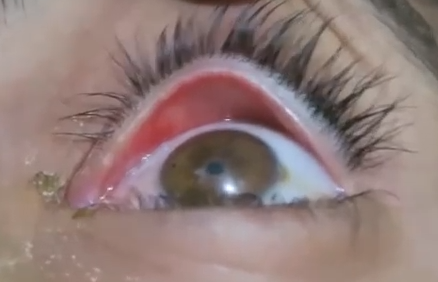 * August 21, 2013: Witnesses to the Ghouta incident reported varying smells: "something like vinegar and rotten eggs" or "like cooking gas," along with "redness and itching of the eyes." (Guardian) As we've found, the hundreds of victims largely seem to be hostages (Monitor). Initial claims trying to prove government guilt fell apart (Lloyd and Postol). Circumstantial evidence and claims lodged to investigative reporter Seymour Hersh suggest Western tests showed the sarin found did not match Syria's stocks. (LRB) In general, sarin doesn't seem to be responsible for the hundreds of dead anyway, and many at least are clear in dying from something else; the found sarin may have just been planted in the soil that was taken, and at low-levels (likely by sipping, as described above) in the survivors who were tested (none of the dead were tested). (Monitor). But still, sarin may have been released, and affected and killed some, and that may or may not be what people smelled. * A smell "like burning nylon" was reported by gassed soldiers in Daraya, February, 2015, who tested positive for sarin, though none died. (OPCW report) It was clear that the rebels, who had the soldiers pinned down under gunfire, launched that against them. In these cases the victims are either government soldiers and the civilians they protect, or it's in a rebel area and the victims seem likely to be hostages. This April 3 attack fits the latter profile (Monitor). Despite these and other precedents, Western and UN officials blandly assure us the non-ISIS opposition has no sarin capability and can be ruled out. But that's not the case, and so we watch for that nightmare scenario. Whoever's sarin appears wherever in the picture, there seems to a big part of it where the stuff doesn't feature at all. As widely noted, rescue workers handle the patients without any protective gear for the skin, even gloves (sarin spreads on contact and is extremely potent - a gas mask or surgical mask, like some have, might protect the face, but that simply isn't adequate to handle real sarin victims). Some workers in hazmat suits are seen in the background. It's said some workers suffered exposure (the White House claims to believe this and uses it as evidence to decide of sarin). But we don't see that on video among those handling the supposed victims, so the claim is likely untrue and at best unproven. Next, sarin has specific observable symptoms besides miosis (constricted pupils) and seizures/paralysis, which is all they show, other than some kind of "foam" around the mouth in some cases. Misosis is highlighted as the "telltale" sign, but it actually has several causes, some of which are alternate poisons of some interest, like opiates. And misos is only the M in the standard sarin symptom acronym SLUDGEM. The other letters stand for Salivation (drooling), Lachrymation (tears), Urination, Diarrhea/defecation, Gastrointestinal distress, and Emesis (vomiting). (Wikipedia, SLUDGE syndrome). The excretory systems go as haywire as everything else, with these parts being visible on the outside. Yet, I don't think I've ever seen this with any of the alleged Syria CW attacks. In those against government soldiers or government-secured areas, the victims aren't shown. In those against rebel areas, they are, and no one displays the SLUDGE syndrome. The same applies here: many victims are stripped to underwear, and as far as we can see, they haven't soiled themselves. They don't seem to vomit that we see, etc. Sarin also tends to cause cyanosis (a deepening blue shade to the skin, especially visible in the lips and beds of the fingernails.) This isn't universally, but common, and it's not exclusive; it has many other causes - but it should appear. Yet we see little if any cyanosis, and in fact lots of rosy cheeks. this red-faced rhythmically gasping kid both seems realistic, likely suffering pulmonary edema, and a clear mismatch with sarin. The extra red could just be from the cold drawin blood to the surface, but it's all red, not purple-blue shifted in the slightest. It's hard to say if that excess red is just from being cold or might be a poison clue (pointing to hydrogen cyanide or carbon monoxide, perhaps). But either way, it argues against sarin. Another important note: Sarin kills very quickly, and the body also breaks it down very quickly - it's a race in microseconds. Survivors of severe exposure describe total paralysis, inability to breathe, their vision going black, and an overpowering sense of doom enveloping them within seconds, followed by loss of consciousness. Almost instantly you'll know how bad it is - if you survive the first minute, then most of the sarin is broken down and you'll probably survive and improve rapidly. If you don't, then it's too late anyway (something to that effect, I'm not sure on exact times - it could take a few minutes to decide - but not tens of minutes - and then maybe a few hours to recover). 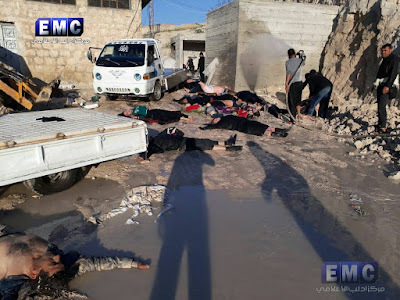 So I don't buy people exposed to sarin were trucked to this place, at the cave hospital on the east edge of Khan Sheykhoun, and were still laying in the mud and wiggling and gasping an hour or so later. (They say the attack was around 6:30-6:45 am, and these scenes seem to be a bit later, mostly between 7 and 8:30, by sunlight angles - see ACLOS section with handy list of shadow-length to time translations one can use to visually time a scene. The scene at right is probably around 8:00). So they say some type of sarin appears in the people and soil tested, and that might be. If they find it's terrorist-grade, I predict they'll never announce the findings, and leave us guessing it was "the regime." But if they find it's pistine military-grade stuff or even matches Syria's formula - and they'll announce that - then we must note... while it shows up in the chosen samples, it was probably not in that foul-smelling, caustic yellow sarin cloud or anyone poisoned by it, or in anyone poisoned with something else - it probably wasn't in the children apparently executed by Islamist blades, or in the apparent fakers acting out a sarin story. Basically, it almost seems it wasn't in this attack at all. But we don't know what there is and isn't - even if there's no outward sign, maybe a special batch of pure sarin was smuggled in and opened up on some people in a basement off camera. Maybe their supply was limited, so the killers placed it where it would be found, where it would matter in solidifying their new Assad CW myth. Otherwise, so far, everything simply says impure terrorist sarin was used, if any was. Again, this could possibly be used by Syrian forces, but that's obviously "not a slam dunk" when terrorists have the same, and motive clearly favors them. As John Wight notes at Sputnik, "The Assad government has nothing to gain from launching chemical weapons attacks in Syria — and never more than now when it is winning the conflict, both on the ground and diplomatically. Indeed, launching such an attack now would be tantamount to insanity." But then, so would launching the 2013 Ghouta attack exactly a year after Obama first offered his "red line" threat/offer, and just a day after UN-OPCW "inspectors" had arrived next to the planned crime scene... The "Assad" of opposition myths like these has always been this insane, and always will be, as long as there are armed fanatics out there willing to realize and document his supposed evil plans. "We know from shell fragments in the crater that sarin had not only been used, but that it was sarin carrying the specific chemical signature of sarin used by the Assad regime. 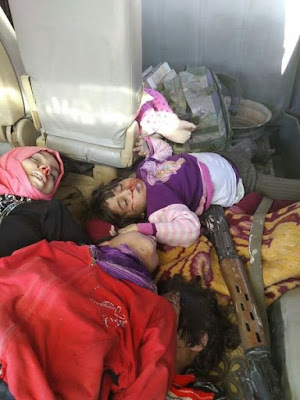 Given that samples from the victims show conclusively that they had been exposed to sarin gas, there is only one conclusion to be reached: that the Assad regime almost certainly gassed its own people, in breach of international law and the rules of war." This confirms what I said - biological samples only shows it was sarin, or in fact only that it's that "or a sarin-like substance" (as reiterated by the OPCW chief), while environmental samples show the chemical "signature" identifying a specific type or formula. In our discussion at ACLOS, Pmr9 notes this is presumably based on tests by the Defence Science and Technology Laboratory (DSTL), and postulates three explanations. It's possible this is pure fiction, or that the match is with Syria's surrendered stocks, as taken away by the USS Cape May. But in either case, Johnson would likely say it matched that known profile most clearly implicating Syria (but again, not with certainty, as explained above). Add 4-24: David Habakkuk asks UK officials for clarification on this question at Pat Lang's blog, Sic Semper Tyranis. About the questions raised here, put carefully, alongside a more vague gist of the implications. Recalling the first reports on coming tests explained "samples" taken by spooks from "the Syrian military stockpile when it was withdrawn from the country in late 2013" had "are known to have particular properties" scientists would look for. If they found that match, they're being just as unclear about it as they were after the Ghouta attack. Add 4-23: Speak of the devil, Denis O'Brien weighed in with LogoPhere's Top Ten Ways to Tell When You're Being Spoofed by False-Flag Sarin Attacks and I didn't notice it. With a PhD in neuropharmacology, a good B.S. detector and his engaging and irreverent tone, this is awesome - an exploration of science vs. images, showing what's wrong with the alleged sarin victims of April 4, as far as we've seen. He clarifies that foaming at the mouth is actually a bit of an anti-symptom (victims can't breathe enough to really bubble up that mucous). He cites the old baking soda and Pepsi trick to cause "foaming at the mouth" of a kind we see. 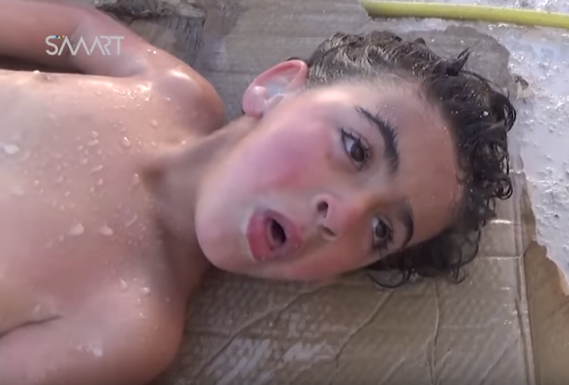 Here's my favorite example of an alleged sarin victim from the April 4 attack. He might overstate the universality of cyanosis or other signs (as a comment points out, low-dose victims or those who die instantly may not display all the signs clear enough to see). But I agree (as less of an expert) he's right that people struggling with a serious dose after a minute or two will not possibly be a healthy pink, but pale or turning to blue. O'Brien helps re-cast Dr. Shajul Islam's video showing the obvious signs of sarin poisoning - he's no expert. He puts the spotlight on a patient's eye to show a constricted pupil, but that's not even miosis if the bright light is causing it. O'Brien adds that we see no tears in this eye - it even seems abnormally dry. Miosis is just the M in SLUDGEM, and the L is lachrymation, profuse tear production. So this likely proves a non-sarin cause - just the flashlight he uses to show it, or perhaps an alternate drug that causes miosis but not profuse tearing. Also noting on that eye: no redness to suggest irritation (this is reported as a first sign), but possible yellow-brown discoloration on the right side, (some iris distortion?) and dried yellow-brown crud in the tear duct corner (the gas is said to be yellow, and secretions yellow-to-brown) - mixed signs, no theory at the moment. 4-23: Autopsy Results (see ACLOS) suggest a problem consistent with everything above: the victims who tested positive for sarin or similar also suffered serious lung damage, leading to edema and suffocation. Sarin doesn't do this in itself, and is likely to kill a victim before anything else could cause this much damage (in a serious case, it makes breathing work poorly, then usually stops it in a swift death). So maybe this is very impure sarin that burns like hell before reaching the fatal point, or a primary poison used in addition to the token sarin, or sarin-like substance. For simplicity alone I'll guess it's all one thing, very nasty impure sarin. That's not something you casually waste. It would be administered efficiently in some enclosed space (gas chamber). 4-24: Dr. Theodore Postol, who helped debunk the 2013 Ghouta attack claims, has been very active on this case. His most recent piece (TruthDig) fixes a basic error (wind direction backwards, as ACLOS noted) in the last piece. The directions he now gives may not be exact, but they seem at least pretty close to what videos show at attack time, moderate breeze from east-to-west. I didn't read this all yet, but noted the part with a dead goat next to a frayed rope some meters east of the white house crater - presumably a stray dragging his or her chewed rope. Postol notes the animal would be upwind and probably immune if stationary or, if mobile, would have died from the sarin too quickly to walk this far, "as the sarin dose within the plume would have killed it very quickly." And here are some victims said to be of this attack, by the Syrian-American Medical Society (via ACLOS). Military-grade sarin does not cause blooding from the nose. Bleeding from the nose and not the mouth can be caused by an unseen head wound. It could also be caused by caustic gas, with no blood out the mouth for some reason. The girl also seems to have purple lips, a rare glimpse of apparent cyanosis, but with signs that contra-indicate sarin. No eye damage to suggest chlorine or the like. The woman has swollen lips, but they don't seem irritated, and has possible white residue around the eyes. But no serious blood to suggest head wounds either ... As I note, they might have had their clothes changed after death (see dust on the girl's palm - as if crawling in the dirt - but clothes are all clean). Anyway, it's all a clear indicator of known regime process signatures and blah blah accountability blah blah. Looking through all available videos there is one with a fake attack including Hadi Abdallah - so the whole incident might have been planned around this 'attack' with the real airstrike being an unexpected incident. Sorry, I don't even get what you're saying here. Friedemann Wo is saying that the bombing of the White Helmets cave compound may have been a staged event. I have the same suspicion, the White Helmets blew up the garage themselves. I have discussed the issue on ACLOS here. The video clip used by NBC Nightly News is fake, it is put together from two separate sequences. If so, one must ask if the sound track with the blast sound is also fake. Hamish de Bretton-Gordon, a former British Army colonel who focuses on chemical weapons in Syria cast doubt on the Syrian and Russian claim, saying "Axiomatically, if you blow up sarin you destroy it". @BowenBBC says it's impossible that the chemical attack in Syria was fabricated as Assad suggests - he's seen the uncut footage. April 4 2017 A statement by the Organization for the Prohibition of Chemical Weapons did not apportion blame and noted it "is in the process of gathering and analysing information." and said that they were from the United Kingdom. The bio-medical samples collected from three victims during their autopsy were analysed at two OPCW designated laboratories. The results of the analysis indicate that the victims were exposed to Sarin or a Sarin-like substance. Bio-medical samples from seven individuals undergoing treatment at hospitals were also analysed in two other OPCW designated laboratories. Similarly, the results of these analyses indicate exposure to Sarin or a Sarin-like substance. It seems that the White House has folded under pressure from the British, who are determined to preserve at any cost the jihadist system that they have created . US president Donald Trump called the chemical attack a 'heinous' act that 'cannot be ignored by the civilized world'. The officials said the idea of establishing a buffer zone between Syria and Jordan — which would be enforced by Jordanian forces on the Syrian side of the border and supported politically and perhaps logistically by the United States — had been discussed. But at this point the buffer is only a contingency. Jun2016 BRITISH special forces are secretly aiding CIA-backed insurgents in south-western Syria, it emerged yesterday. Troops from an unspecified unit have been aiding the New Syrian Army (NSA) at the al-Tanf border crossing with Iraq, close to Jordan, according to the Daily Telegraph. No serious steps have been taken to investigate into the alleged chemical incident in Syria’s Khan Shaykhun, Director of the Armaments Non-Proliferation and Control Department at the Russian Foreign Ministry Mikhail Ulyanov said. #Urum_al_Kubra Here is Ammar Alsalmo beside the car of murdered Red Crescent chief Omar Barakat, looking very pleased with himself. AbdHabak had a great time in #Khan_Sheikhun as well. Here is the photographer causally taking pictures while children were blown up. On 28 March, an agreement was reportedly brokered by Qatar and Iran for the evacuation of Fu'ah and Kafriya in exchange for the evacuation of residents and rebels in Zabadani and Madaya. now first responder in Khan Shaykun ? On 29 April 2013, Saraqib in Idlib’s countryside was attacked by a helicopter with missiles carrying chemical weapons. A number of victims were transferred to Turkey in order to provide samples for labs in the USA and UK. SHRC has been informed that their test results were positive and that chemical substances were found in the samples. The photographer Jeffry Ruigendijk photographed a salafist Al-Nusra fighter carrying a riot control gas canister that looks very similar to the ammunition debris found at the attacked places. On 26 August, five days after the chemical attack on eastern Ghouta, MiG fighters launched an attack on Ma’jad Iqra’ school ion Urum al-Kubra, south west Aleppo at approximately 5.00 p.m. when the children were still at school. This led to the death of 38 people, mostly school children and inflicted 100 others with severe burns. The victims’ tests have revealed that the burns are a result of the use of napalam, an internationally banned incendiary. Urum al-Kubra Insight: Saving Syria's Children - The Worst Case Of Fake News? With many in the U.S. foreign policy community backing both the ouster of Syrian President Bashar al-Assad and the defeat of the Islamic State group (ISIS), a new report could raise some cause for concern. The report says Assad's military has been the most engaged faction against ISIS over the past year of Syria's conflict, making it an extremely risky target for a U.S. foreign policy that is intended to stop the jihadists' advances. The report published Wednesday by the London-based IHS Jane Terrorism and Insurgency Centre, one of the world's leading security analysis agencies, says 43 percent of ISIS's battles between April 1, 2016 and March 31, 2017 were fought against the Syrian military and its allies, which include Russia, Iran and pro-government militias. Meanwhile, the U.S.-backed Syrian Democratic Forces (SDF), a majority-Kurd coalition of Arabs and ethnic minorities, accounted for 17 percent of the action against ISIS. .."It is an inconvenient reality that any U.S. action taken to weaken the Syrian government will inadvertently benefit the Islamic State and other jihadist groups," Strack said, according to the report. "The Syrian government is essentially the anvil to the U.S.-led coalition’s hammer. While U.S.-backed forces surround Raqqa, the Islamic State is engaged in intense fighting with the Syrian government around Palmyra and in other parts of Homs and Deir el-Zour provinces." Many don’t speak Arabic and their role in Syria is little known to the outside world, but the Chinese fighters of the Turkistan Islamic Party in Syria are organized, battled-hardened and have been instrumental in ground offensives against President Bashar Assad’s forces in the country’s northern regions. Thousands of Chinese jihadis have come to Syria since the country’s civil war began in March 2011 to fight against government forces and their allies. Some have joined the Al-Qaeda’s branch in the country previously known as Nusra Front. Others paid allegiance to the Islamic State group and a smaller number joined factions such as the ultraconservative Ahrar al-Sham. whose vast majority are Chinese Muslims, particularly those from the Turkic-speaking Uighur majority native to Xinjiang in China. Their growing role in Syria has resulted in increased cooperation between Syrian and Chinese intelligence agencies who fear those same jihadis could one day return home and cause trouble there. and Junud al-Sham in the 2015 Idlib province offensives. The affinities with al-Qaeda were always clear, and the group eventually pledged allegiance to Jabhat al-Nusra following on from Jaysh al-Muhajireen wa al-Ansar's pledge of allegiance to Jabhat al-Nusra. The first news came from Reuters, framed accusingly: “Syrian government chemical attack,” and quoting, as usual, rebel sources. (the Damascus outskirts) and Hama. Al-Qaeda and its allies managed to occupy considerable territory, surprising the Syrian Army. Following weeks of fighting, Damascus and its allies not only recovered all the lost territory in Jobar, but also advanced further in Al-Gabone, an area never reached for over 4 years. In Hama also, the Syrian Army managed to absorb the shock wave of the first attack and counter-attacked, recovering almost 90% of the lost territory. As in Aleppo, Joulani supervised the offensive to break the siege of the Syrian northern capital, supervising the military operations room and finally losing the battle, leaving behind hundreds of his militants dead on the battlefield. June 7th, 2016 As the Jaysh al Fateh (“Army of Conquest”) coalition, which was cofounded by the Al Nusrah Front, continues its renewed offensive in southern Aleppo, two Uzbek jihadist groups are also taking part. The groups, Katibat al Tawhid wal Jihad and Katibat Imam al Bukhari, have long been integrated with Al Nusrah, Ahrar al Sham, and other allies on the battlefield. 2016-02-26 Islamic State seized tons of toxic Hydrazine material after seizing control of Lafarge Cement Syria in Aleppo province in September 2014, the material that might had been used later in the ISIS explosives-laden vehicles. Among the elements found in the samples were hexamine, a hallmark of sarin produced by the Syrian government, according to the report. It said the findings matched the results of samples obtained by French intelligence, including an unexploded grenade, from an attack in Saraqib on April 29, 2013, which Western powers have accused the Assad government of carrying out. The six-page French document - drawn up by France's military and foreign intelligence services and seen by said it reached its conclusion based on samples they had obtained from the impact strike on the ground and a blood sample from a victim. "We know, from a certain source, that the process of fabrication of the samples taken is typical of the method developed in Syrian laboratories," Foreign Minister Jean-Marc Ayrault told reporters after presenting the findings to the cabinet. "This method is the signature of the regime and it is what enables us to establish the responsibility of the attack. We know because we kept samples from previous attacks that we were able to use for comparison." French government is probably the most active governement in the search to remove Assad, it is quite visceral. The French journalists Malbrunot en Chenot published a book in 2014 called Sur les chemins de Damas, where they bring the information they received from French diplomats and members of secret services that these were forced to act according the policy of the French governement and that they had to manipulate the rapports on the use of chemical wapons concerning the Goutha attack. I did not read the book but I can think that evenso these journalist would not be supporters of Assad, on the contrary. Concerning Syria the French governement is the last one one should believe. French intel were forced by Hollande to "trim" their 2013 report because they said it is plausible the rebels had those CWs. Antoinette, Anon(s): Indeed, the flag the FSA 'rebels' used to fly was the French mandate flag, I think. Anyway, that's what they're looking back to, besides weakening Iran, etc. like all the other drones are programmed for. Saraqeb match over Ghouta is odd. * Maybe that's the case France has access to samples from (I don't know of them having samples, but maybe - they say they do). Maybe other governments are comparing to their own samples and also finding matches. Maybe not. * Maybe they think mentioning Ghouta is a bad idea considering the questions. But mentioning Saraqeb (4-29-2013) is maybe worse - one of the stupidest CW stories so far, with clear gov. allegation the victims were, as I usually suspected, hostages gassed by terrorists. * Or maybe that sarin had the most specific similarity to the KS attack kind. If so, note Saraqeb is the closest of the high-profile sarin attacks to this new one. Why would Assad use a special type of sarin in inner Idlib province, as opposed to, say, the terrorists operating there? * That last seems most interesting, but I suppose it's more likely to not be the case. It's probably the first option. Hexamine not unique to chemical weapons. Found in possession of terrorist, in 2013, by police in Northern Ireland. On 29 April 2013, Saraqib in Idlib’s countryside was attacked by a helicopter with missiles carrying chemical weapons. A number of victims were transferred to Turkey in order to provide samples for labs in the USA and UK. You find everything in the alleyways of Zintan, where we were taken by Colonel Mokhtar Khalifa, second-in-command and charged with defending the city. He moved around all day with the Koran in one hand and a Colt in the other. There are empty ammunition cases piled up in a stairwell. A tin cylinder, 50 centimeters high, 20 centimeters in diameter, labeled, “1 igniter for napalm bomb,” found in Gaddafi’s fort at Bir Ghanam (indicating, as well—and this too would be a real piece of news—that Gaddafi is using or preparing to use the dirtiest of dirty weapons). Unit 8200: Perhaps the most formidable weapon in Israel's anti-jihadi arsenal isn't explosive. It's digital. Unit 8200 is the Israeli military's signals intelligence (SIGINT) unit, Jerusalem's equivalent of the National Security Agency. For a small country of 8 million people, Unit 8200 gives Israel a huge global capability for tapping communications and conducting cyberwarfare across the Middle East and on a global basis. If suspicions are true that the Stuxnet virus at least partly originated from Israel, then Unit 8200 was probably involved. SIGINT may not confer a decisive advantage, but it will enable Israeli commanders to monitor jihadi movements and—like the United States—identify key leaders for targeted assassination by aircraft or drone. On April 27, the Israeli Air Defense Forces launched a Patriot missile at an alleged drone that penetrated the Israeli airspace coming from the Syrian airspace. It was not clear that if the missile hit the target. The Patriot missile launch came after Israel targeted an alleged arms depot with weapons sent from Iran to Hezbollah at the Damascus International Airport. Several rockets were fired by Israeli warplanes at the Damascus International Airport and one of them hit the main fuel tanks at the airport causing a massive fire. This raises questions about the validity of the Israeli claims. April 22, 2017 Two missiles were fired at 06.45 p.m. when government forces were repulsing Al-Qaeda’s attacks in the vicinity of the city of Quneitra. Apparently, Israel had prepared and launched a missile strike in order to provide artillery support to Al-Qaeda terrorists. The Israeli drones recorded in the province of Quneitra make it possible to conclude that Al-Qaeda is provided with reconnaissance information from the battlefields with Israel help too. The U.S. also learned that the MIT, Turkey’s national intelligence agency, and the Gendarmerie, a militarized law enforcement agency, were working with al-Nusra including in efforts to develop a chemical weapons program for the jihadist group. The MIT handled political liaisons while the Gendarmerie handled logistics and military training – including in the use of chemical weapons. In 2013, this dark alliance would prove how desperately President Erdogan wanted the U.S. to interfere in Syria and overthrow the Asad regime. There are reports that President Erdogan secretly supports Jabhat al-Nusra, the al-Qa’ida affiliate in Syria, and may have coordinated with the group to launch chemical attacks in 2013 that the U.S. publicly attributed to the Asad regime. In late May 2013, the CIA had briefed the White House on al-Nusra’s sarin weaponization program. IS was also working on a chemical weapons program. Al-Nusra was operating in areas close to Damascus including Eastern Ghouta. with the Iraqi military who moved his operations to Syria. There, he reportedly joined al-Nusra. He has experience producing mustard gas and was implicated in making and using sarin. Ahmed is a high-value U.S. military target. Director David R. Shedd indicated that al-Nusra indeed had the ability to produce chemical weapons. In late July, Shedd spoke of al-Nusra’s chemical capabilities at the annual Aspen Security Forum in Colorado. The analyses carried out by French experts on the environmental samples collected at one of the impact points of the chemical attack at Khan Sheikhoun on 4 April 2017 reveal the presence of sarin, of a specific secondary product (diisopropyl methylphosphonate –DIMP) formed during synthesis of sarin from isopropanol and DF (methylphosphonyl difluoride), and hexamine. Analysis of biomedical samples also shows that a victim of the Khan Sheikhoun attack, a sample of whose blood was taken in Syria on the very day of the attack, was exposed to sarin. provide samples for labs in the USA and UK. / have been tested. The report does give details of a munition used in 2013 in Saraqib: a grenade containing only 100 ml of Sarin. Also odd. The munitions allegedly used could hold only as little as 200 ml of a toxic chemical. 27 April 2017 A report by the French intelligence services containing France’s conclusions about the alleged use of chemical weapons in Khan Shaykhun in Idlib Province, Syria, has been released in Paris. France is the third country after Turkey and Britain to have conducted a probe into the chemical attack. The impression is that the above countries either do not trust the OPCW or are trying to steer its investigation in a particular direction. to be tested by a French military laboratory. 16 June 2013 On May 27, on the eve of a crucial meeting of EU ministers on the possible delivery of arms to the "rebels", French daily Le Monde published a report by Jean-Philippe Rémy attesting to the use of sarin gas in Damascus. The reporter brought back samples of blood and urine to be tested by a French military laboratory. French Foreign Minister Laurent Fabius wasted no time in reacting, while the British government cried out against a "war crime." 8 December 2012 The Free Syrian Army released a video in which it boasts of preparing chemical weapons. d) This intelligence on the process used by the regime, which is a sign of its responsibility in the attack on 4 April, is based notably on the analysis of the content of an unexploded grenade which was used with certainty by the Syrian regime during the Saraqib attack on 29 April 2013. That midafternoon, a helicopter arriving from the north -east flew over the city of Saraqib at high altitude. Three unidentified objects, emitting white smoke, were dropped on neighbourhoods to the west of the city, on a north-south trajectory. After being smuggled into northern Syria by rebel activists, John Cantlie captured the situation in Idlib province first hand as President Assad's forces continued to try and crush the rebels. Cantlie documented the continuing protests against the Assad regime before finding himself in the thick of the bloody crackdown against them as government forces moved in on the Free Syrian Army. A recently released jihadist video produced by the Saraqeb Media Office features a group that calls itself the “Soldiers of the Omar Farouq Brigade in Syria” and urges Muslims to join the jihad against the army of embattled President Bashir al Assad. The group is named after a senior al Qaeda operative who was killed in Iraq in 2006. Hamish de Bretton-Gordon is a former commanding officer of the British Army's Chemical Counter Terrorist Regiment who now runs a firm that specialises in the study of chemical weapons. In this podcast dated 1 July 2014 from Wilton Park (an NGO funded by the UK Foreign Office), HBG states (starting about 7'20") that "in March last year there was a reported sarin attack in Sheikh al-Maqsood and I helped the Times - chap called Anthony Loyd who very sadly got shot two weeks ago - to cover this story and tried to get samples to the UK for analysis." He also confirms that he was present later with Ian Pannell in Saraqeb and says "we tried to get samples from that and couldn't - that subsequently proved positive for sarin". Syrian activist groups on Wednesday reported another suspected chemical attack in the northwestern province of Idlib, with one group tweeting that a dozen people were "suffocating." Activists have reported several attacks since then, and the council earlier this month heard from a Syrian doctor who treated victims from a half-dozen of them. "Everyone smelled bleach-like odors" and heard the sound of helicopters, Mohamed Tennari said of one incident. Helicopters dropped containers of toxic gas overnight on a town in Syria's Idlib province, a rescue service operating in rebel-held territory said on Tuesday. head of the Syrian Civil Defense group, told Al Jazeera that 33 civilians, including 18 women and 10 children, were brought to a local hospital after the attack in the town of Saraqeb. "Just before midnight, helicopters dropped five explosive barrels containing cylinders of chlorine and shards of metal on neighbourhoods in Saraqeb," he said. Al Nusra-occupied city of Khan Shaykhun, Idlib. The photo, above, clearly demonstrates the close relationship that Saleh shares with his friend and colleague Yussef, and apparently with the armed militant seen standing behind the two White Helmet leaders. 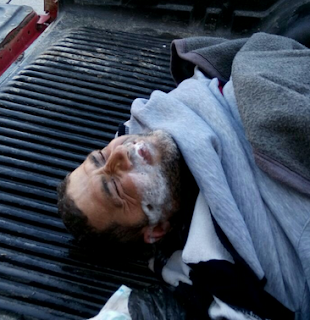 Unidentified, civilian (this is likely the 7th person the SOHR didn't hear about, and it seems maybe no one got a name for. UK Foreign Minister Boris Johnson praised them and announced a grant of GBP 32 Million to them. With direct funding to the White Helmets from US-led Coalition countries already well in excess $150 million – international stakeholders expect a return on their investment. The panelists insisted that they were apolitical, seeking only an end to war. They just wanted the United States to build a movement to stop the conflict. The White Helmets and three other recipients were each to receive 750,000 kronor ($88,000). “Bareesh” und andere White hemet-Terroristen-Kumpane welche mit Millionen von Dollars finanziert werden. After the incident near Aleppo, the UN set up a fact-finding mission. The investigation, however, got stalled as a group of Western countries insisted on a more thorough inquiry, which would also look into alleged chemical weapons use in Homs in December 2012. The first two real-time reports of a deadly chemical attack came at about the same time, in late December, 2012. These came from the government and from the opposition, each blaming each other for two separate incidents, one in Damascus and one in Homs. Al-Harati, who has dual Libyan and Irish citizenship, first visited Syria last year on what he calls a "fact finding mission" to see the situation on the ground and find out what Syrian rebels needed. A member of Turkey’s parliament says the country’s Hatay Province on the border with Syria has become a hub for CIA and Mossad spies moving into Syria. The legislator of the Republican People’s Party, Refik Er-Yilmaz, said that thousands of CIA and Mossad agents are currently in the province and are moving freely in the area, Turkish media reported. Turkish police remain mute spectators as the spies carry various types of identification, Er-Yimaz said. He also accused the authorities of allowing American and Israeli troopers on Turkish soil without any approval from the parliament. The governor of Hatay mentioned in a press statement that this camp is a special camp and no one could enter the camp except him. So, Dec 4-6, Al-Nusra comes in possession of the biggest concentration of chlorine in Syria, maybe 400 tons - useful, but only so useful - as a weapon. Then on the 8th or so, as they check out the overrun 111 base and allegedly stumble upon sarin and mustard gas... they feel a need to send extra trucks to pick of some more chlorine, perhaps even having to leave behind the mustard gas? New evidence indicates that the Syrian government used suspected nerve agents in four chemical weapons attacks since December as part of a broader pattern of chemical weapons use, a human rights group said Monday.Human Rights Watch said in a report that the "widespread and systematic" attacks on civilians using chemical weapons could constitute crimes against humanity. "The government's recent use of nerve agents is a deadly escalation — and part of a clear pattern," said Kenneth Roth, executive director of Human Rights Watch. "In the last six months, the government has used warplanes, helicopters and ground forces to deliver chlorine and sarin in Damascus, Hama, Idlib and Aleppo. "This also shows "that serious use of chemical weapons is becoming a central part of its military strategy," he said during a news conference to present the report. May 02, 2017 According to field sources, the army soldiers continued military operations to take back control of the remaining bases of the terrorists in Northern Hama. perhaps even having to leave behind the mustard gas? 02.05.2017 On Sunday evening, Daesh terrorists once again used chemical weapons against Iraqi troops and civilians, a local source told Sputnik. The mustard gas bombs were dropped on the al-Saura quarter, in the southwestern part of the city of Mosul. This is the eighth attack in which the terrorists have used chemical weapons. It was launched at a time when Iraqi government forces entered the district to rescue civilians. Such attacks are also aimed at preventing the advancement of the Iraqi army. Daesh previously launched a chemical attack in the al Saura district on April 22. The attack killed six people and injured 12, a source in the internal security forces told Sputnik Arabic. Back in April it was reported that over 80 residents of Mosul, predominantly women and children, had died as a result of inhaling toxic poisonous gas. 10 April 2017 Syrian activists from Idlib have been sharing video on social media purportedly showing warplanes dropping what looks like white phosphorus in the town of Saraqeb. Leith Fares with blue jacket,“HRW”´s Chloringas-Hauptaugenzeuge “Laith Fares”. told me in Qatar that the Assad government would not hesitate to use chemical weapons if it wanted to. At Atlantic Council, Raed Fares was introduced by Hilary Clinton’s former advisor on Syria, Ambassador Frederic Hof. "We know that 90% of weapons in terrorists' hands have been sent from Turkey and we think that the terrorist groups in Idlib which are led by the Turkish intelligence agencies are the culprits behind the Khan Sheikhoun incident," he added. May 1 2017 On three other occasions in the months leading up to the attack on the town of Khan Sheikhoun, witnesses, doctors and human rights investigators say, government attacks left scores of people sickened with similar symptoms, like foaming at the mouth, shaking and paralysis — including two attacks in December, little noticed at the time, that killed at least 64 people. At a news conference held at United Nations headquarters in New York to release the report’s findings, the executive director of Human Rights Watch, Kenneth Roth, ridiculed what he described as “preposterous” assertions by the Syrian and Russian governments denying responsibility. MOSCOW, May 2. /TASS/. The Soviet Union never exported HAB-250 bombs and never stuffed them with the nerve agent Sarin, Gen Igor Konashenkov, the official spokesman for the Russian Defense Ministry said on Tuesday in a comment on allegations by the New York-base advocacy Human Rights Watch that fragments of a Soviet-made bomb designed to deliver chemical warfare agents had been tracked down in the Syrian town of Khan Sheykhun, Idlib Governorate. Konashenkov also reminded that not a single OPCW expert has been to Khan Shaykhun yet: "Taking this into account, the emergence of a pseudo-sensational investigation of this very shell crater by so-called HRW experts, along with the 'finding' of the fragments of a Soviet KhAB-250 aviation ammunition with 'traces of sarin' should not be surprising." HRW presented a photo of mock-up of KhAB-250 ammunition from the Russian Armed Forces museum in Moscow as a definite 'proof' of this bomb being used in Syria, Konashenkov said. #SyriaHoax by naive @hrw. It used a pic provided by White Helmets. Can you see what was added to the crater? ..In May 2015, a White Helmet member named Muawiya Hassan Agha provided an extensive eyewitness account to the Violations Documentation Center in Syria on the alleged deployment of chemical weapons by Syrian government warplanes in Idlib. A year later, Agha was exposed by pro-government social media activists for filming a grotesque video depicting extremist Syrian rebels torturing two captured soldiers they later executed. EA Worldview editor-in-chief Scott Lucas reported that Agha was expelled from the White Helmets days later. Muawiya Hassan Agha aus Sarmin und seine Kameraden anwesend.